And a quilt top I finished on monday...it's a pattern from Cottonway the newest April tabletopper. I used Marcus Brothers Bleeker Street just like the pattern. 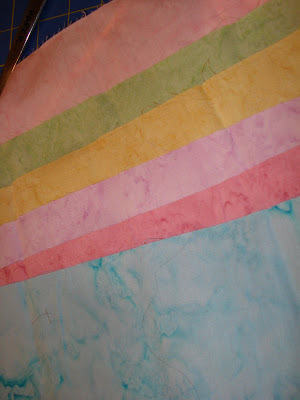 I love the colors of this one....now how to quilt it....my usual dilemma. I couldn't wait to piece this table runner since it was so easy. I used the new Red, White,and Bold fabric by Sandy Gervais. Now I just have to get quiltin' these...I have about 15 flimsies right now. Books, WIP's...and just more Eastery stuff...AKA "hodge podge"
Ah more decorations here and there...just need spring in my life right now. I picked these up at the Party Store while shopping for a Bratz birthday party theme. I will have a 7 year old and Bratz are big with her. This little bunny tabletopper is from atleast 4 years ago....but I thought I would share. I tell ya I have so many projects to finish. I am the typical crafter/quilter/knitter. Last count I had 48! This little hat was an extra block from another small quilt I am making..it is still a WIP too. I am thinking of making it into a small pillow. Does anyone recognize that fabrics? Susan Branches' first line called Language of Flowers. I LOVE this fabric. I bought some at my LQS in Rochester MN...and the rest on ebay. There were days that some prints would go for $80 a yard!!! I am not kidding. No I did NOT pay that much for the fabric...pinky swear! Anyhow...I love this fabric. Recognize these bunnies? Well I bought the pattern last weekend...already a WIP! 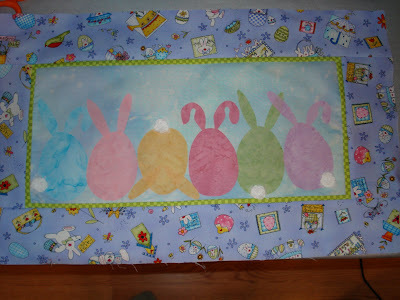 Actually the bunnies and flowers need to appliqued and then it can be layered to quilt. Making progress...but I couldn't find the right brown thread....then I did and I started on it again....could be done by Easter at this rate. It would appear as if Anita has tagged me. I hope I don't scare you all away with my facts!!! 1. I hate bananas. It's true, I have no allergy but the texture etc...just can't eat them. 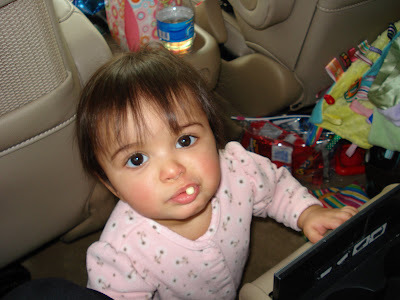 When my oldest daughter was a toddler I would put the banana in my mouth and say "yum" to get her to eat one...then sneak and spit it in a napkin. Incidentally...she loves bananas. 2. I have been sewing since I was 8 years old, crocheting for 22 years and knitting for 5 years, & rug hooking for 4 years. I had to nearly stop crocheting while in dental school because the repetitive motion of both was causing me to have carpel tunnel nerve pain. I started quilting to replace crocheting. 3. The entire task of grooming my toe nails some how makes me nautious. I do, however cut them and get pedicures...I am not THAT weird LOL. 4. I have lived in 3 states in my life so far. Iowa, Minnesota and Ohio. 5. I have a vacation home in South Carolina, . 6. My favorite food(s) are made by my mom, A spiral ham, baked beans and scallop potatoes...but they have to be made by her. She doesn't measure...she eyeballs it. So no, I still haven't been able to replicate it. 7. 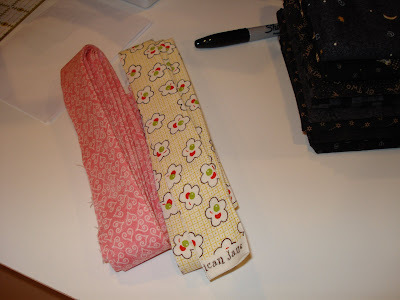 I LOVE 1930's fabrics...I have collected well over 1500 prints so far. Let's see I am going to tag Karen, Cindy, Jackie, Doe , Connie , Darlene, and Lissa. Have fun with it girls. And Yes I too read ALL your blogs! Since we drove so far I just had to stop in our downtown area. Very close to the quilt shop is the base of the Fourth Street elevator. I am horrible with history and I have know idea how old this is. It was used to move 2 people at a time, up the side of the hill. It is very hilly in Dubuque where I grew up. Interestingly, the rest of Iowa is flat though. See all the snow? There is literally 4 feet on either side of my parents drive. Ugh...AND after ALL that driving....we have to leave early....today in fact...2 days early as a storm is coming and we have to be ahead of it. A view down the street reveals....the corner of a quilt shop? Here are my goodies. I couldn't resist the new Moda Red, White and Bold charm pack for a table runner. I am sooo into tablerunners lately as you have probably read. Also a super cute bunny topper...because I NEEDED another one! LOL. This shop has great samples and kits. Fabric-wise...they have a mix, some 30's, childrens, Civil war and Amy Butler.....usually a few trendy moda lines in charms and jellies. I love their kits though....that's why I stop/shop. I had thought I'd forgotten my camera and they thought I was nuts that I wanted to blog about their shop but I squeezed a few pics out of them! This was a tabletopper kit I wanted but they didn't have the pattern.....probably a good thing since Valentine's has past....oh but what about next year? Did I mention they dabble in wool too? wool yarn and wool fat quarters....punchneedle etc. It's a good store for a bit of everything really. So I was only really going to look for 3 things....didn't get a single one of them...but I was a happy camper anyhow. 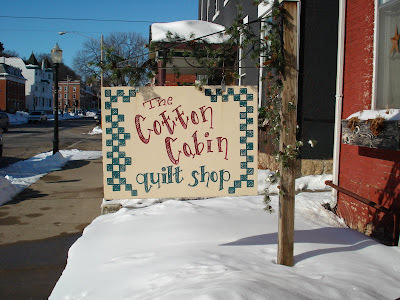 Now before we leave today....I am hoping I can visit the other quilt shop. It has a TOTALLY different style. I have not gotten fabric there in the last 3 trips but I still go...just in case.....plus I still need the Quilt Pink II border fabric, Moda Blossom border fabric....and one other fabric...I can't remember....where's that darn list! Valentine's Day where did you go? Where did Valentine's Day go? 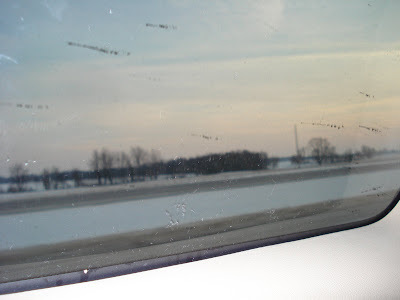 well we drove 9 hours to Iowa.... A long cold trip LOL...view from the window for 550 miles! 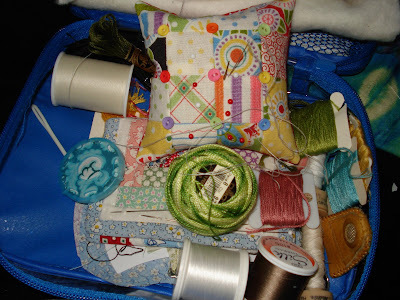 My sewing kit of sorts...as messy as my sewing room. 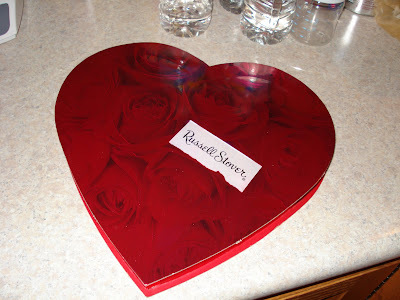 My hubby brought me this sweet treat...very thoughtful of him. He also gave each of our girls a treat. This morning we left no time for rest. My mom immediately started working on my hair and cutting my daughters. 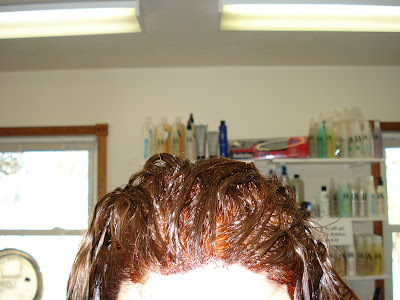 I thought you'd like to see my color! 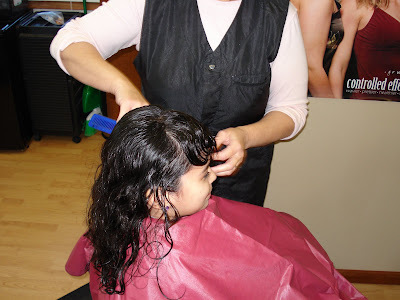 Here's her getting a cut...she did o-k. My husband had his cut too...it was a family outing of sorts. After that we headed to lunch and shopping.....to the local quilt shop!!!!!!!!!! yippee...I will post pics soon. I'm 30...What age do you act? You are a thirtysomething at heart. You've had a taste of success and true love, but you want more! You're responsible, wise, and have enough experience to understand a lot of the world. You're at the point in your life where you understand yourself pretty well. You are figuring out what you want... and how to get it! 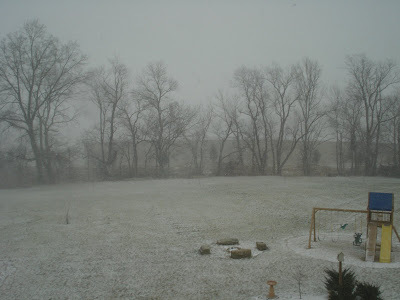 A view of my back yard...ugh where's the sun? I finally put up my magnetic cork board from JoAnn's. Look closely and you will see some WAY cool postcards from Leanne....thanks Leanne, love them! 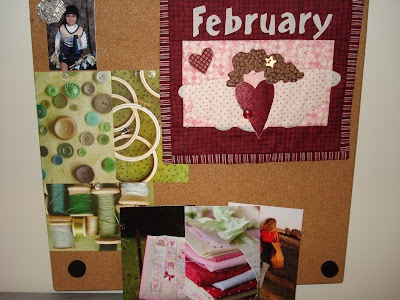 I made the february wall quilt, I made all 12 months from Art to Heart book about 6 or 7 years ago. I thought I'd lost them...but I found them in a box with batting scraps. Ah what was I thinking when I packed that box?? What I got accomplished last night...2 bindings...hey it's something. 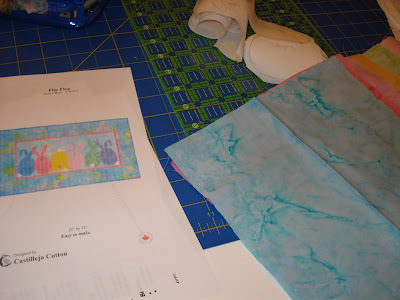 Oh and I forgot I did this on monday night... layered the bunnies for machine applique Yippee! 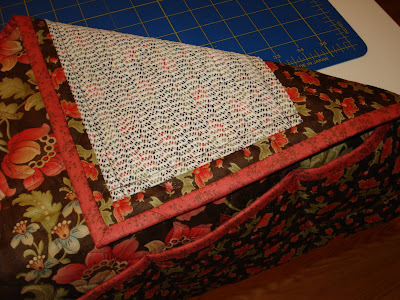 A fellow quilter replicated this sewing machine pad with pockets from another quilter at a retreat. I have no idea who made the pattern or if there even is one. I just measured her pieces and am going to eyeball it! 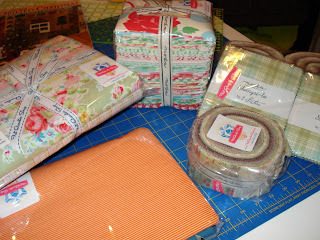 LOL She used a remant for hers...I have some cool pre-quilted fabs I could use. Notice in the picture there is a rubber backing...just shelf liner I guess. I can't wait to do this one. I am still working on figuring out Photoshop..I think I need photoshop for dummies! Well after receiving soooo many wonderful comments and being joined by Linda, Monica, Julia,Connie, Carey, Anne, Kim, and Sharon herself...I am so pleased will how we bloggers pull together. We are a generous bunch for sure. I used a random number generator this time because after my last giveaway my 6 year old kept the name papers in her hat for 2 weeks and lugged them all over the house. I got tired of picking them up! So this time was a googled number generator for yah. 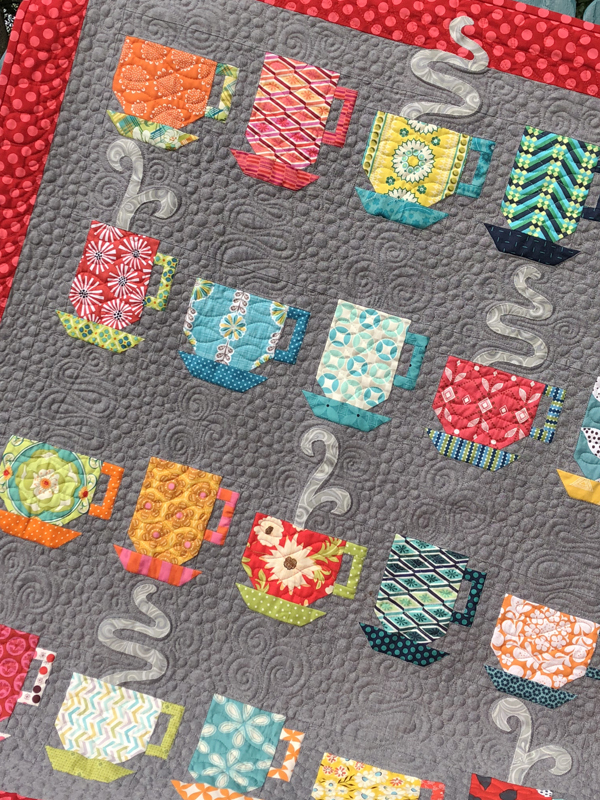 Drum roll please.....the pincushion winners are......Toni Upquilter, Pam Pamkittymorning, and Lissa Jane !!! 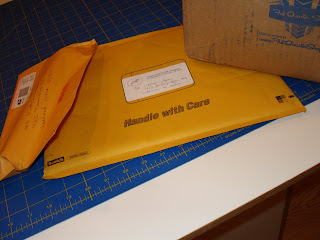 and just to be the nicey nice person I am ...I have some 1930's charm pack to send to a few other bloggers whose number came up..... Sheri, Vickie of Vickie's Crafts, Brooke Quilty Chick and Janet. Ladies..please send me your mailing addresses and I will send the goodies off to you soon. Ahh that's as far as I got LOL! Look at ALL the packages today...it's a GRRREAT Thursday!!!!! A 10 lb. box of fabric love today LOL. I shouldn't have..but I didn't know it at the time. But I can't send it back. 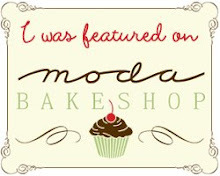 I have subscribed to Suz Guz BOM and she is doing it with Moda's new Swell. 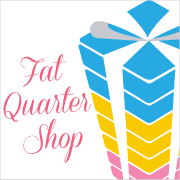 I got a FQ pack and some Lecien florals that remind me of Cath Kidson, plus a few sales items too...I just love the Fat Quarter Shop! 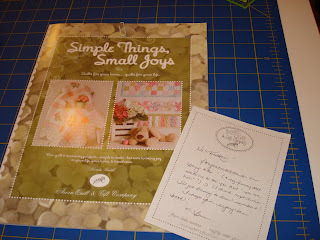 and looky here... Brenda from Little Acorn Quilts' sweet dad drew my number for this awesome new pattern book. I just adore it. Thanks Brenda. 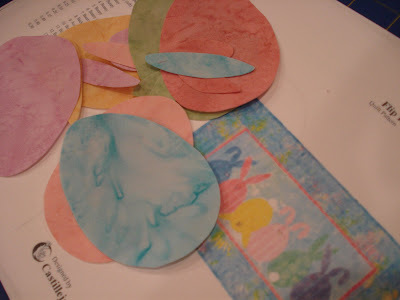 I finally got my YLI silk thread so that I can finish my reverse applique Water Lily. I hope I can do that this weekend. 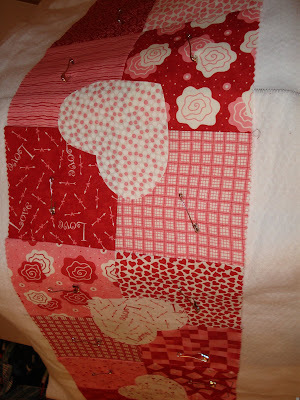 In addition to that I have been working on some WIP's, and a Valentine tabletopper...here is my progress.... 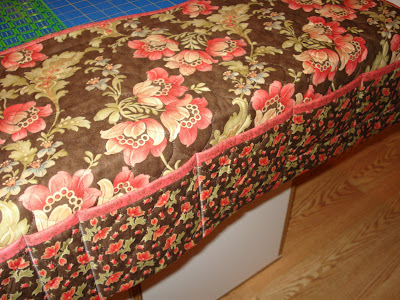 I am going to try to post the pattern free for the table topper as I made it up myself...do you need a pattern?? 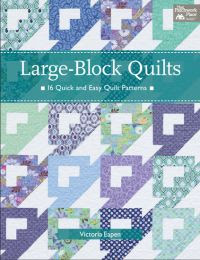 I am coveting Happy Zombie's awesome pdf patterns and hoping that I too can make something so pretty and appealing. 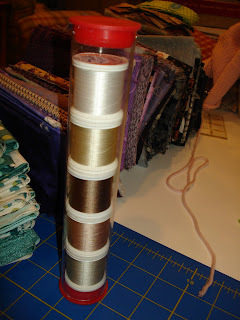 On top of that, I used my stash...well a charm pack and fabrics that I had purchased over a year ago..so I call it stash. I have not officially jumped on the stash reduction band wagon but still want to use what I have. After I organized my fabric I found so many that I just love and want to use and I am saddened that I have not gotten to them by now. I think this will be a finishing up year....I'm optimistic! "There is one thing I must say because it's been bothering me, a certain someone has said that I give things to people just to buy friends." Sharon is a fabulous blogger whom I read often, as often as she posts. Granted I have never met her personally but I believe she is a genuine individual. She writes about herself, her life and trials and tribulations and pokes at fun at life in general. 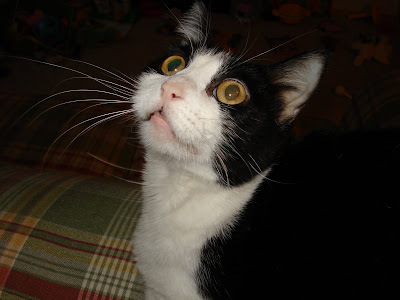 She also blogs about her adventures and people she meets. I find it irritating that there is someone out there that would say she is giving things away to 'buy' friends. There are sooo many generous bloggers out there, it is so insulting to say such a thing. I am not going to continue to Rant on this but to offer in my support of Sharon...a giveaway!!! 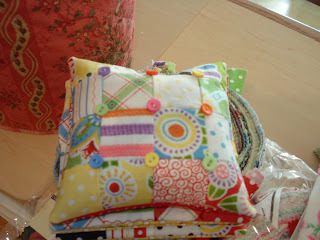 I have made 3 cute little pincushions with the new Mary Engelbreit fabrics from Moda. All I have left is to stuff them...so leave a comment here before February 8th and I will draw for 3 lucky winners.